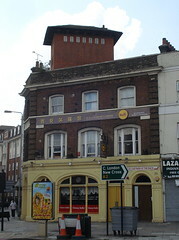 Xi'An Restaurant was a Chinese restaurant in Deptford. It has now closed. According to The Guardian, as of early 2018 the premises are occupied by a branch of Sanxia Renjia. Although its most obvious offering is the buffet of standard Anglicised Chinese food prominently displayed in the front windows, it also has a specialist menu of food from Xi'an, capital of Shaanxi province in Northwest China. The decor is basic, with upright chairs at melamine-topped tables seating around 45 people. The floor is tiled, and paper Chinese lanterns hang from the ceiling. A bar at the back of the room has fonts for Carling and Cobra lagers. Kake has visited for lunchtime takeaways three times now, most recently on a Tuesday in April 2015. Each time there was either just one other customer in, or no other customers in. Service has generally been very friendly, especially when they realised I was interested in regional Chinese food and wasn't just there for the buffet. Stewed pork Chinese burger (肉夹馍; roù jiā mó; £3 in February 2015) photo was generously filled, and the meat was very good; well-seasoned, cooked to a "pulled" consistency, and not dry at all. The flatbread it came in was good, too, though it needed to be eaten quickly as this style of bread goes hard when it cools. Qishan saozi noodles (臊子面; sāo zi miàn; £5.50 in March 2015) photo had plenty of numbing Sichuan pepper; some chilli was evident too, but the Sichuan pepper predominated. Little cubes of soft tofu gave a good texture contrast with the lamb, and the vegetables (carrots, spinach, potatoes, wood ear fungus, and straw mushrooms) added more interest. The noodles themselves were good too, clearly hand-made. The broth was packaged separately to stop the noodles getting mushy. Liang pi cold-skin noodles (凉皮; liáng pí £4.50 in April 2015) photo were nicely refreshing with their soy-vinegar sauce (which again was packaged separately), and a good texture too. (This dish is served cold.) As far as we know, this is the only restaurant doing this dish in London at the moment. Kake's verdict: I'd happily get takeaway from here again, and I'd like to eat in some time too. Accessibility: A tiny step to get in. Toilets not yet checked. Last visited by Kake (for takeaway), April 2015. Last edited 2018-01-14 13:32:29 (version 4; diff). List all versions. Page last edited 2018-01-14 13:32:29 (version 4).